Have you ever watched one of those nature shows featuring fights between bull elephant seals? The combatants waddle up to each other, bellowing and puffing out their chests, and lifting their snouts in the air. They put on a big show of machismo. I also noted that the really good barristers (male or female) tended not to posture and swagger. They were the top of the seal pack and they knew it! 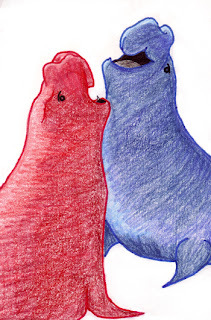 Sometimes activities in the blogosphere (particularly left vs right confrontations) remind me of those bull seals. The prime example of bull-sealishness lately has been the conflict between Andrew Landeryou (in the Blue Corner) and Jeremy Sear (in the Red Corner). In short compass, it involved a post where Sear criticised parents who sent their children to private schools, but Landeryou then exposed the fact that Sear himself had been to several private schools in his youth. If I had been Sear, I would have admitted that I had attended private schools, as in my opinion, it is hypocritical not to mention it. But Landeryou also included a link to Sear’s mother’s personal details. It seems to me that this is “just not cricket”. [Perhaps in the circumstances I should confess that this attitude may be a product of my own attendance at an English private school for 3 and half years? ;-)] Why should Sear’s mother and family be dragged into this? The fight continues, and each has been threatening the other with defamation. I can’t be bothered detailing it any further. Sear has now written a rather nasty personal attack on Greg Sheridan of The Australian, dealing with Sheridan’s article about his father’s death. Hmm, wasn’t he complaining about personal attacks…? I really don’t like the personal nature of many left-right stoushes, and the way in which anyone from the “other side” gets pigeonholed immediately (“feminazi”, “leftoid”, “moonbat”, “wing nut”, “Blairite”, “fascist” etc, etc). I look at many different blogs, including some with which I disagree vehemently, but I hope I never “get personal” in my criticisms thereof. I just don’t enjoy watching bull seals on a rock, posturing and bellowing. Maybe I saw too much of it in the court room? Anyway, it all seems a bit hollow to me these days. I like an exchange of substance, where each participant is willing to listen to the other. I’m not a great fan of Mr Lefty and his blogs. I’ve only looked at them occasionally. As I’ve said, I prefer not to look at issues from a stereotypically “left wing” or “right wing” perspective, and I find his blogs a bit pious and predictable in general. However, it seems that some nasty pasty has gone and hacked into his blogs. This person deleted all of the posts and then the same person (or another person) took the blogs over for himself. That’s an awful thing to do. It is theft. I’d feel pretty darn distraught if anyone did that to me, and I don’t think anyone (left wing, right wing or any other wing!) deserves that kind of treatment. A plague on the house of the person who did that. He has set up a new blogsite here.